Blaming may be your greatest enemy and obstacle to making your goals happen. Making excuses and denial is a game we play with ourselves, but blaming gives uninvited responsibility for your behavior to another. Trust me, they don’t want it! In fact, they will throw it right back at you with triple the thrust. You now have antagonized those who might have been your greatest support system in helping you make the desired change. The real danger in placing blame is that you convince yourself that others are controlling your life and your choices. You are creating a velvet prison. You have created your own trap and thrown away the key. By blaming you are giving all your power to another human being which only creates a deeper state of powerlessness and helplessness – the root cause of blaming. It is vicious cycle that you are perpetuating. Watch your language. When you say things like, “You drive me crazy,” you are reinforcing the illusion that you are not in charge of your sanity or control. If you are in a relationship where you are continually being blamed, refuse to accept it. Blaming is an alcoholic’s attempt to regain the control they have relinquished in their self-imposed state of helplessness – drunkenness. 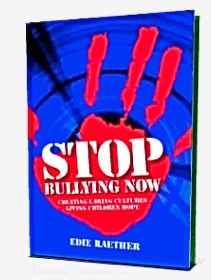 Edie Raether, MS, CSP is known as the Bully Buster. She is a Change Strategist and international speaker, coach and bestselling author of seven books including Stop Bullying Now. A behavioral psychology expert and family therapist, Edie has also been a college professor and talk show host with ABC. Visit stopbullyingwithedie.com and www.raether.com. Contact her at edie@raether.com or (704) 658-8997.